‘What are your strengths and weaknesses?’ This is one of the most common questions asked in a job interview and very few people answer this question. For most of the candidates discussing their weaknesses and strengths is like an intricate task to be done. Job candidates either avoid giving an answer to such a question or fail to respond well. A major reason might be that this question directly relates to the person’s traits and habits. But if you wish to grab the job, then the best way to answer such a question is to emphasize on the truth, highlight what you are good at, and minimize what you are not so good at. Other than this, there are few important aspects that you need to consider if you wish to answer well this question. But, before you dive into how you can answer this question in the best possible way, it is first essential to know why interviewers ask it. Before you answer this or any other question during your interview, it is essential to comprehend why the interviewer asks this question. Any question put up by the interviewer is not just out of a set format; rather the interviewer is interested to know some details about you directly or indirectly that can affect your work productivity and quality. The main reason for the interviewer or the hiring team to ask this question is to analyze and figure out qualities that are needed for the overall success of the team and the company. It is believed, that a person with strengths related to the job is able to perform well as compared to those who does not relate to it. As far as weaknesses are concerned, the major reason for asking this question is to analyze the qualities that could hinder the overall job performance. So, if you take it light then you would find it a simple and direct question that is easy to answer, if you act genuine. Your Strengths and Weaknesses – How to Discuss? Make sure you are honest to the interviewer and honest to yourself. Don’t give a framed answer that you have learned or gathered online. You need to present a realistic answer in order to confirm the interviewer that you are showcasing only the true character and nothing else. Also, if you speak honestly, then answering even such a tricky question would be easier and simpler for you. You might be one loaded with numerous strengths and weaknesses, but it is not essential that you list all of them to the interviewer. To make sure that you answer this question well and to win the interest of the interviewer, it is essential that you pick only those strengths and weaknesses that are related to the position you are applying for. Emphasize on strengths that are related to the job position and select weaknesses that create less impact on the job. If a question is placed in front of you, then it is essential that you answer it well. Don’t try to avoid it as it would create a negative impression on the interviewer. Talk about your strengths and weaknesses with confidence and believe that there is no shame in presenting your weaknesses to the interviewer. Your negatives are equally important as your positives and you must be confident about them. So, whenever such a question is put to you, don’t try to avoid it, rather attempt it and try delivering a qualitative answer. If you are asked to give an example for any of your weaknesses, then make sure you don’t blame anyone. If it is a genuine and an honest one, then things would be simpler for you. But, if you are framing the answer then make sure you don’t blame or showcase negative behavior towards another individual. Now that you know the reason interviewers ask this question and what they are seeking for, you can prepare a genuine response customized to precisely offer them what they have been looking so far. Whenever you are in need to present your strengths, specifically during a job interview, the best way to answer this question is to stick to strengths that can create a positive impact on the job position. If your strengths are suitable for that specific job, then this can be a bonus point and it would also increase the chances of your hiring. For instance, if you are applying for a position based on a project and needing lots of association, interaction, and meetings, then it would be great if you present strengths like a team player, efficient to meet the deadline, effective communicator, problem-solving, and more. Since it is a team job so don’t make a mistake of highlighting your independent role or you can deliver best only when you are working alone. Make sure that your strengths are always in alignment to the mission and values of the organization. It is because this makes the interviewer feel that you are fit for the company’s work culture and would be able to deliver better results within the environment. For this you need to do some research prior going to the interview and identify what the core organizational values are. The best way is to always go through the company’s website as it can also brief you about the work culture of the organization. If you don’t want to engage into any trouble or feel disturbed during your interview, then make sure that you are prepared with a real-life example for every strength that you have mentioned. It is the most efficient and quickest way to answer this question without experiencing any trouble. It even communicates your message to the interviewer in a precise way. For Example, if you state that you have great communication skills then you can prove it with help of an example confirming the same. There are possibilities that the interviewer might ask you to prove all or any one of your strength right during the time of interview. So, make sure that what you speak, you must be able to prove it. This can also impress the interviewer and can offer you with the job opportunity. While it is quite easier to discuss your strengths, discussing your weaknesses might be little tricky than this. If the interviewer questions about both your strengths and weaknesses together, then a good way to answer this question is to start by speaking about your weaknesses first and then ending the answer on a positive note by highlighting your strengths. But if the interviewer asks you about your weaknesses individually then you must be keep few vital points in consideration. Make sure to deliver an answer that is honest and authentic. If you offer an honest answer then you would seem believable and trustworthy. If a person genuinely connects with you, then discussing such situation becomes much easier and less fabricated. So you must always try to present weaknesses that are genuine and that can be well connected to the emotional being of the interviewer. Whenever you pick a weakness, you must be sure to pick one that is relatively small and that will not directly impact your job performance. Your weakness must not be in contradiction to the core values and mission of the organization and even does not reflect your negative character. If you have weaknesses, like lying, use of drugs, cheating, or any other, then you must not list it during your interview. You can discuss your weaknesses, such as delegating tasks, being too straight, and similar, as this would not create a direct impact on your job performance. The most important thing that you must remember while discussing your weaknesses is to make sure that you cast your weaknesses in a positive direction and does not over criticize yourself. You must avoid self – depreciation as this could create a negative impact on the interviewer. It is essential to follow the trick of maintaining a balance between being humble and honest and maintaining high level of confidence even when you are discussing small negatives about yourself. The important thing while answering the question about your weaknesses is to make sure that you give a valid example and a solution for your weakness. This always shows that you are not just aware of your weakness, but you have even started to rectify it. Giving examples shows that you are proactively working to rectify your weaknesses. One efficient and simple way to answer this question is to identify the core skills and strengths needed for the position you are being interviewed for and then present an honest weakness, which is not necessary to gain success in that specific job. For instance, if you are applying for a team lead role, then you may present the weakness that would not affect your job role, like fear against injuries or inability to prepare your finance report. If you are not able to figure out any weakness then a wise way is to alter your negative into a positive. There are numerous such weaknesses that can be altered into strength. Just make sure that you select a weakness that can also be presented in a positive way as otherwise the interviewer would cross question you and you might enter into an issue. 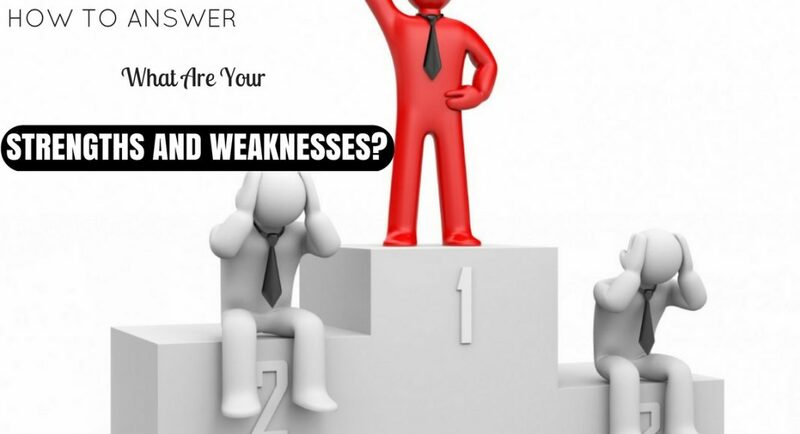 How to Identify your Strengths and Weaknesses? Whether you need to answer you strengths, weaknesses, or both, the best way to answer this question is to make sure you divide your skills into different categories as follow. Dividing your skills into these categories can help you prepare a better answer to the question. These are the skills gained through education and past experience, like computer knowledge, degrees, technical details, and more. These are the skills that are mandatory to do a job and you cannot do without them. These skills might change depending on the technology used and on the basis of the job to be done. There are certain skills that are common to every job and that you can use in any job. Communication skills, teamwork, on-time delivery, are some of the skills that you must possess no matter the level or type of the job. These are also called as personal or soft skills, like confidence, optimism, flexibility, analytical thinking, dedication, working under pressure, and more. If you have such skills then you can probably be more productive to the job for which you are being hired. Whether you are stating an answer for your strength or your weakness, just make sure you end the answer on a positive note. Also be attentive, confident, and genuine while answering such a question as these are the core rules to frame the perfect answer to this question and to impress the interviewer.